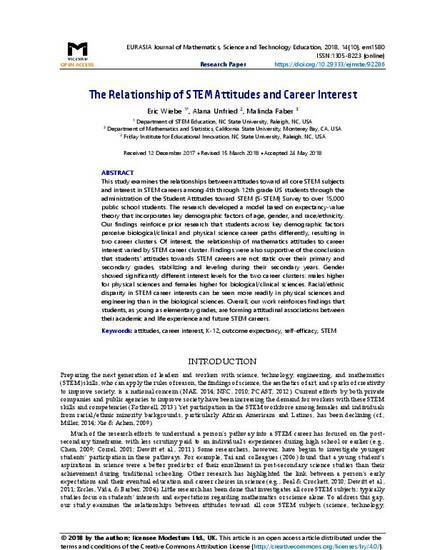 This study examines the relationships between attitudes toward all core STEM subjects and interest in STEM careers among 4th through 12th grade US students through the administration of the Student Attitudes toward STEM (S-STEM) Survey to over 15,000 public school students. The research developed a model based on expectancy-value theory that incorporates key demographic factors of age, gender, and race/ethnicity. Our findings reinforce prior research that students across key demographic factors perceive biological/clinical and physical science career paths differently, resulting in two career clusters. Of interest, the relationship of mathematics attitudes to career interest varied by STEM career cluster. Findings were also supportive of the conclusion that students’ attitudes towards STEM careers are not static over their primary and secondary grades, stabilizing and leveling during their secondary years. Gender showed significantly different interest levels for the two career clusters: males higher for physical sciences and females higher for biological/clinical sciences. Racial/ethnic disparity in STEM career interests can be seen more readily in physical sciences and engineering than in the biological sciences. Overall, our work reinforces findings that students, as young as elementary grades, are forming attitudinal associations between their academic and life experience and future STEM careers. Published in EURASIA Journal of Mathematics, Science and Technology Education, available via https://doi.org/10.29333/ejmste/92286. © 2018 by the authors; licensee Modestum Ltd., UK. This article is an open access article distributed under the terms and conditions of the Creative Commons Attribution License (http://creativecommons.org/licenses/by/4.0/).